Choosing a quality flashlight is no walk in the park. You have to scrutinize through the different brands and features that different flashlights offer. The Klarus g20 LED flashlight is an excellent light with great features. 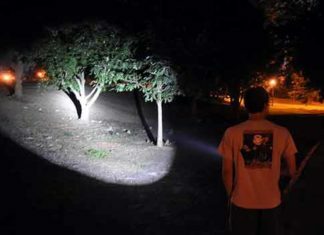 If you a newbie in tactical flashlight, you will have to try out several flashlights before landing on the one you think is ideal for your activity. The Klarus G20 one of the brightest flashlight of 3000 lumens, has 4 different lighting modes, 2 switches, 150 hours maximum run-time, waterproof and lots of advanced features. Read this Klarus G20 review article to know why you should think to buy this Mini USB light. The Klarus g20 flashlight is strongly built with aersospace aluminum body and has a hardened glass lens with anti-abrasive coating. It uses CREE XHP70 N4 LED with a maximum of 3000 lumens. The flashlight has the capability to reach a distance of 150 meters and comes with 4 different light modes. It is powered by one 26650 Li-ion battery with 5000 mAh capacity. Features like the smart ITS temperature control system and battery level indicator makes using this flashlight to be fun and safe. 4.1 Why Klarus G20 dual switch LED flashlight? I’ve written this review on Klarus g20 dual switch rechargeable light to help people like you to avoid the stress of having to go through several lights before deciding on one. Even though Klarus is a new brand, it has already created a name for itself and is now considered to be one of the best. Other popular flashlight of this brand is 2000 lumen klarus xt11gt and 1600 lumen klarus xt12gt. It provides an extremely bright illumination with its max lumen of 3000. The beam produces reaches up to 150 meters. The flashlight is very easy to use with the dual switch and simple operation. It is compactly designed for easy handling of the device and storage when not in use. The lanyard and holster can be used to properly keep the flashlight. It is lightweight and won’t be cumbersome to attach to our belt or keep in the bag during camping or when carrying out any other outdoor activity. This flashlight can survive tough conditions like dust and rain as it has an O-ring that seals internal parts and waterproof ratings of IPX8. Features like the battery level indicator helps the user to know what percentage of battery power is remaining and use the flashlight accordingly. It has a strobe and SOS mode. The strobe mode can be used to disorient an enemy while the SOS mode is used when one is in danger or lost in order to alert other people. 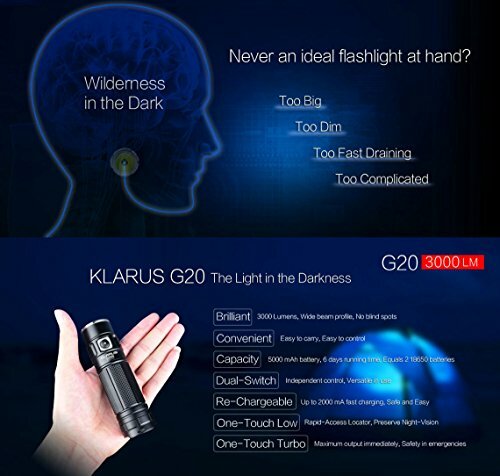 Klarus offers the buyer of the g20 LED flashlight a 5 year warranty which is outstanding. When in turbo mode, the flashlight heats up very fast. This limits a person for how long he or she can use bright light as the heat protection circuit changes the mode to another light level. Why Klarus G20 dual switch LED flashlight? Why acquire a flashlight that can’t withstand hardships? The Klarus g20 LED flashlight is sturdily created to be utilized in tough conditions. It is made of aerospace grade aluminum body. This is a durable material. It is also lightweight and ideal for a tactical flashlight. Furthermore, the flashlight is built with a hardened mineral glass lens with anti-reflective coating. Such features make it to reliable and dependable for long term use. A tactical flashlight is as good as it can last. If you are going to use a flashlight outdoor, it should be able to last you through the entire session. The Klarus g20 3000 lumen flashlight has a wonderful run time of 6 days or 150 hours. 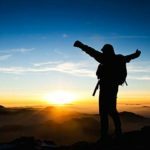 This means that you will continue to have excellent light for a 5 day camping trip to the mountains. Besides offering you with a longer run time, this flashlight offers extremely bright light. This ensures that your camp or dark room is well-lit. With a far-reaching beam distance of 150 meters, this flashlight can light a football pitch. The brightest level runs on 3000 lumens which is just amazing for such a small flashlight. One of the special features of the G20 LED flashlight is that it comes with various brightness levels. If you speak to any outdoor enthusiast, they will gladly tell you the importance of having a flashlight that offers different light levels. This enables the user to have control over the total battery power used. The Klarus g20 flashlight has 4 light modes and two specialty light modes. These include low – 15 lumens, medium – 160 lumens, high – 650 lumens, turbo – 3000 lumens, strobe – 3000 lumens, and SOS – 160 lumens. This LED flashlight is suitable for rough surrounding and adverse weather conditions. It can stay under water for up to 30 minutes as long as it is between 0 to 2 meters. It is also impact resistant up to one meter. So, you can use it for survival, rescue mission, outdoor or for tactical situations. The flashlight is conveniently designed for simple handling and use. It is small and lightweight. The dual switch enables the user to operate the flashlight with one hand and switch to different modes easily. Unlike most flashlights on the market, the Klarus g20 dual switch flashlight is very safe to use. This is because it has a smart ITS temperature control system that detects when the flashlight temperature increases and it lowers it through changing the light mode. In return, this prevents the flashlight from overheating. Also, the battery level indicator allows the user to know what power percentage is remaining. Klarus is a great brand with quality flashlights. The brand offers a 5 year warranty to purchaser of the g20 rechargeable flashlight. This is a great thing and one can rely on the flashlight to deliver. 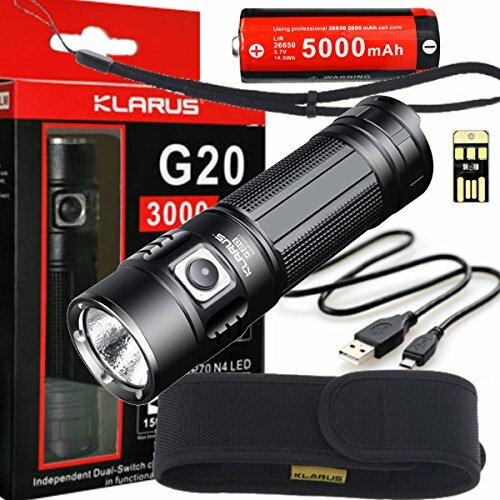 The Klarus G20 rechargeable flashlight is a great light for people who are looking for a small reliable flashlight. It is convenient to carry around due to its size but has a very powerful throw. It can cover up to 150 meters with a maximum of 3000 lumens. Built with aerospace grade aluminum metal, this is a very durable LED light and can withstand impact up to 1 meter. Also, it has the ability to stay under water to a depth of 2 meters for 30 minutes. With such amazing features, the Klarus g20 is an ideal tactical light for campers, hikers, hunters, and patrol individuals. It always delivers in different environments and can provide light up to 6 days. I hope this Klarus G20 review article has given a clear idea about this flashlight.